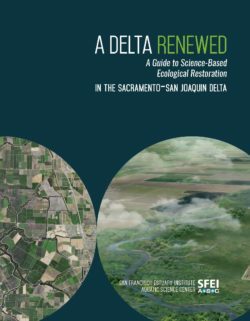 This report uses a reconstruction of the historical (early 19th century) Sacramento-San Joaquin Delta landscape in concert with contemporary data to elucidate restoration opportunities and constraints at the McCormack-Williamson Tract and within the surrounding Delta setting. Historical ecology encourages a landscape-level perspective of restoration through improved understanding of how physical processes created and maintained habitat mosaics in the recent past. This perception of landscapes can be used to evaluate current conditions and develop future restoration scenarios. We used the recently completed study of the historical Delta landscape (Whipple et al. 2012) to explore opportunities for the McCormack-Williamson Tract (MWT), a 1,645 acre (6.6 km2) tract along the Mokelumne River (Figure 1 and Figure 2). 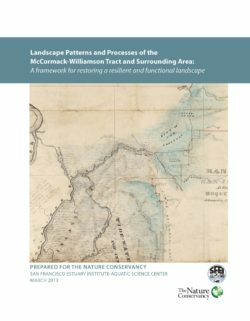 This site exemplifies the need to balance contemporary constraints to restoration (including existing infrastructure and flood protection concerns) with the goals of landscape-scale restoration. To explore some of the strategies and opportunities available to advance the landscape-scale restoration in the MWT area, three general concepts emerged: increasing landscape complexity, connectivity, and resilience. To understand how to interpret and improve these attributes, we developed conceptual models that placed the site within the larger landscapes of the historical Delta, relating local habitat features to regional controlling physical gradients. 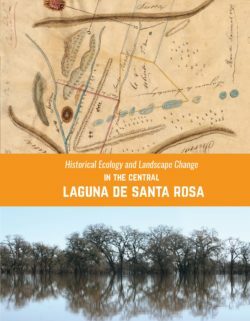 This aided interpretation of the contemporary physical landscape and allowed identification of opportunities and constraints to both short-term and long-term landscape-scale restoration. The historical record reveals features such as floodplain lakes, forests on natural river levees, and tidal channels in the study area. These and other features could be strategically incorporated into a restoration vision, or an “operational landscape unit” for this part of the Delta (Verhoeven et al. 2008). This type of perspective can help focus restoration targets, including the relative proportion and placement of different habitat types and landscape elements within project design constraints, maximizing the site’s ecological potential. The landscape-scale approach also identifies opportunities to improve ecological connectivity and long-term adaptability to sea level rise and other environmental changes. Some of these opportunities may be critical to the ecological function and resilience of the area, but may not be able to be addressed in the immediate MWT project design. Thus, a central component of translating a historical landscape perspective to site-scale design is envisioning an adaptable restoration process that spans short-term restoration actions that are possible within the site’s bounds, while maintaining a longer-term vision of what is needed at the landscape scale. 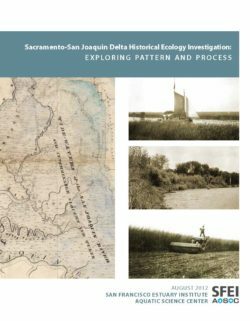 In 2012, SFEI researchers (in collaboration with the CA Department of Fish and Wildlife) completed a historical ecology study of the Sacramento-San Joaquin Delta. The project improves understanding of what the Delta looked like and how it functioned prior to the significant modification that has occurred over the last 160 years. 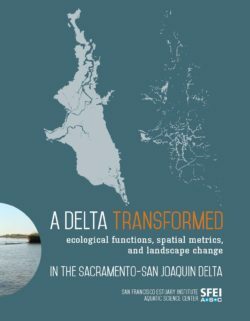 This historical reconstruction documents patterns of variation and extent of habitat types throughout the Delta for improved understanding of species support functions and controlling physical processes within the native landscape. Knowing how different parts of the vast historical Delta looked and functioned provides needed information for future restoration strategies.